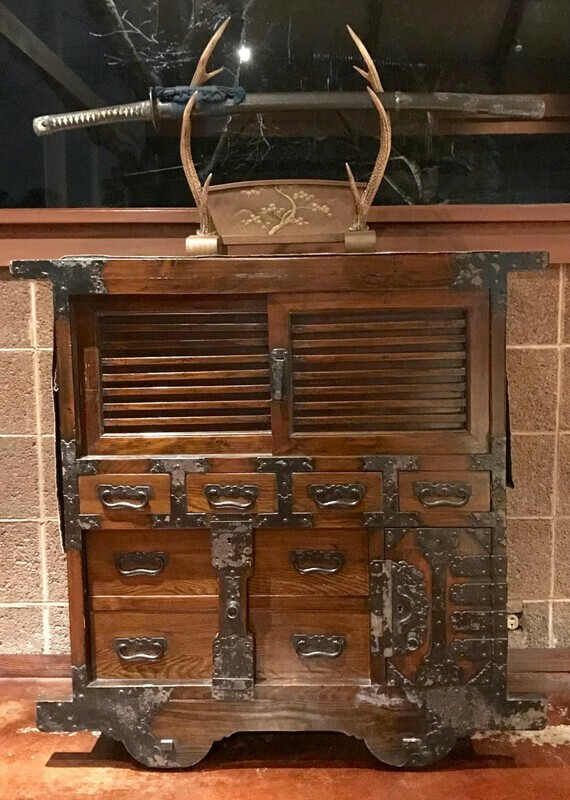 This antique Kuruma Tansu (wheeled chest) is the perfect way to display your treasured swords and store your tosogu. 38.25” (wide) X 16.5” (deep) X 38.5” (tall). I’m leaving for a quick drive across the US on Wednesday (March 6) and can deliver this tansu for free (free delivery - the tansu is not free...) if you happen to live in any of the cities that I’m visiting (or along the route). Atlanta - New Orleans - Houston - Tucson - Phoenix - San Diego - Los Angles (if you want me to bring it for free, you’ll have to commit to buying it and let me know before Wednesday). Shipping in the U.S. would probably be about $500-600 (I probably can’t arrange shipping until I return from my trip). In very good condition for such an old chest. Has key and all locks work. Iron finish could use some touchup care, but the wood and finish are in very good condition. Price: $2,500 (these regularly sell for $4-6k). If you are really serious and would like more pictures, let me know. If I were still living in NYC, I'd kill for this. The wheeled chests were bloody expensive and a friend had to import his from Japan for a lot more than you are asking. That is a beautiful kake too. It is very different from my own, but strikingly nice. Lovely lovely rendering of the tree. This really is a steal... Last chance (two more days till I leave, and I will probably put it in an auction like Bonhams when I get back). Beautifull George. If it where somewhere in europe i would take it. This price is really a steal. The costs for the wood and irons is much more, the work itself is not payable today.